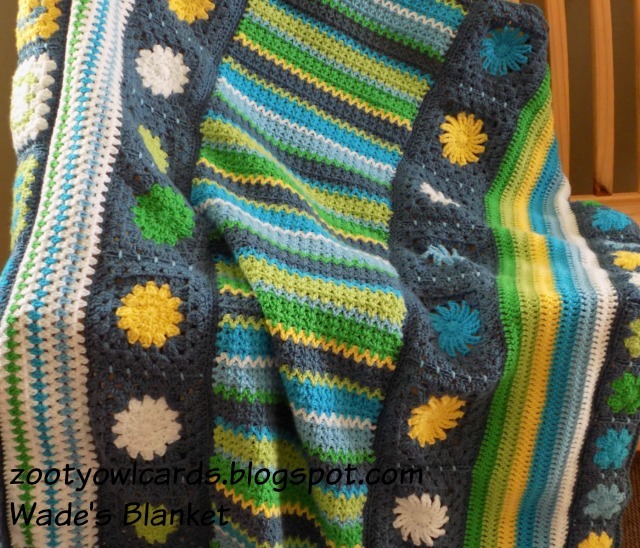 Hello and welcome to Part 8 of the Wade's Blanket CAL, hosted by Zooty Owl and Kokopelli Design. 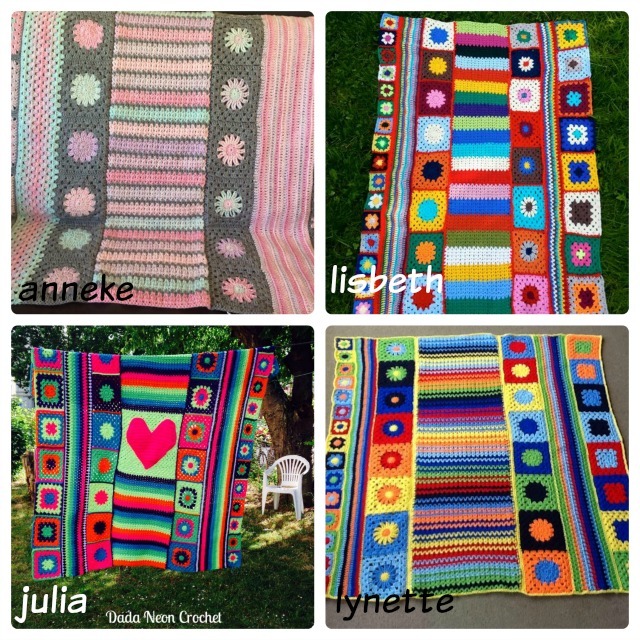 This is our final instalment but the patterns will remain on our Blogs - so you can make Wade's Blanket at your own pace. We decided to surprise you with a choice of two borders and two edgings which you can mix and match as you please! Row 1: Crochet a round of sc around the entire blanket. Note: into each of the 4 corner 2ch work 2sc, 2ch, 2sc. Where a corner of a square is joined to a stripe work 1sc into the corner 2ch, 1sc into the join. Across your vertical stripes (the dc stripe) and the diamond granny stripe work 1sc into the first dc post, 2sc into the next dc post (alternating 1sc, 2sc into each post). Work 1sc into each ch at the bottom of your v-stitch panel, and 1sc into the top of each dc at the top of this panel. Row 2: Crochet 1dc into each sc around the entire blanket, working 2dc, 2ch, 2dc into each corner 2ch. Rows 3 - 4: Crochet 1dc into each dc around the entire blanket, working 2dc, 2ch, 2dc into each corner 2ch. Row 4: Crochet 1dc into each sc around the entire blanket, working 2dc, 2ch, 2dc into each corner 2ch. Note: Since both borders are relatively simple and do not require any complex counting or concentration I have included links to You Tube Videos for those who have not yet been exposed to the relevant stitches (techniques) - please, please do not feel shy to ask if you have a question with regard to this post though! Crochet a row of reverse sc (crab stitch) into each stitch around entire blanket, working 2 reverse sc into each corner 2ch. Please send Andrea and I the photos of your finished blankets so that we can include them in our Ta-Dah Posts in two weeks time!!!! We hope you enjoyed this CAL as much as we did and look forward to receiving your pics for our grand "Ta-Dah" post!!!! I love your colours and the finished blanket. I haven't started mine yet, but hope to soon, I have got such a lot of projects on my to do list!